Portable Antiquity Collecting and Heritage Issues: Friday Retrospect: How Many 'Metal Detectorists' are there in England and Wales? Friday Retrospect: How Many 'Metal Detectorists' are there in England and Wales? How Many 'Metal Detectorists' are there in England and Wales? The Ixelles Six /Helsinki Gang debacle got me thinking about the data they were trying to ignore. For the past two years I had been struggling with the implications of some of Sam Hardy's recent research and the numbers he came up with. I have long asked the question concerning the scale of Collection-Driven Exploitation of the Archaeological Record as the only true background against which to measure the incessant 'propaganda of success' of the PAS and its supporters. They saw 'x000' more metal detectorists than a few years ago, and got 'y000' more artefacts in their database, all well and good, but to what degree are these figures representing any true mitigation of the information loss? Back then (first years of the 21st century), there were some wild estimates of overall 'metal detectorist numbers', but nothing concrete. So I began to look into it. The figure I came up with in 2003 was quite a low one, 10000, with just over a thousand in Scotland. That was the basis for the figures used in the Heritage Action Artefact Erosion Counter. About 2010, I was forced to reassess that original estimate, it seemed to me that by that time the number had probably gone up to 16000 (Thomas 2012, 58-9 has a similar estimate), and I ascribed this to the PAS popularising the hobby through their support and promotion. That's when I really began to see the PAS as having a totally negative influence on the very problem that they had been set up to solve. In 2011, the NCMD was claiming there were around 20000 metal detectorists in the UK. By 2015 the NCMD estimate appears to have risen to 25000 (see here and here), which I was inclined to dismiss at the time. But then in 2017 Sam Hardy produced his figures of 27000 'metal detectorists' (in England and Wales) and another 1000+ in Scotland. I must admit, though I thought his methods were sound and the figures he was using were the best available at the time, I really was a bit sceptical of such high numbers. Until I sketched a graph out. 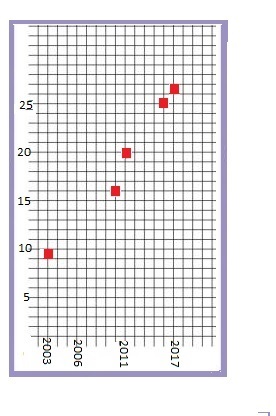 The two lower-left points are my own estimate, the three on the right are the NCMD's and Dr Hardy's. They seem to work together quite convincingly to tell a story of expansion of this damaging hobby on the PAS's watch. What however has not increased by the same degree is the proportion of the finds they are currently making being recorded in the public domain. The implications of these figures would seem to be that the increase may have been of the order of 17000 more detectorists' in 17 years. That is that while PAS has been legitimising and promoting Collection-Driven Exploitation of the archaeological record, numbers of metal detector-using artefact hunters have been quite steadily rising by 1000 a year. We have no statistics on the number of scattered ephemeral private artefact collections formed in the UK at the same time. That post ended: "At what stage are Britain's heritage professionals going to get up off their complacent jobsworth backsides and stop shoulder-shrugging and do something about this other than just smile and pat the collectors on the head?". Let us see how many people take part in the consultation urging far-reaching changes in how this problem is dealt with.